NACOGDOCHES, Texas - The Stephen F. Austin State University School of Music and its Friends of Music Concert Series will present guest artist Brian Perry performing a double bass recital with SFA pianist Hyun Ji Oh at 6 p.m. Monday, Feb. 4, in the Music Recital Hall on the SFA campus. One of the newest members of the Dallas Symphony Orchestra, Perry is an adjunct associate professor in the Meadows School of the Arts at Southern Methodist University. He was also a member of the Fort Worth Symphony Orchestra for nine seasons. Perry will present the program "Songs and Dances on Double Bass," which features works that explore either the "singing" quality of the bass or that consist of music inspired by Baroque dance forms. "Both styles serve to highlight the possibilities of the double bass beyond the orchestra and in a solo setting, as both a rhythmic and rich-sounding instrument," Perry said. Among the pieces to be performed is Johannes Brahms' Allegro non troppo from Sonata No. 1 in E minor for cello and piano. "Originally written for cello, this work has a rich, low-singing quality that works quite well when played on the double bass," Perry said. "In this transcription, I've slightly altered some of the octaves in Lucas Drew's arrangement to better suit the range of the bass while also trying to sound as much as possible like the original work. I enjoy working on transcriptions (pieces not originally written for my instrument) for the bass, and this is one of several on the program." Perry will also perform Claude Debussy's "Beau Soir," which he describes as "quintessential impressionist writing, both in tonality and expression." 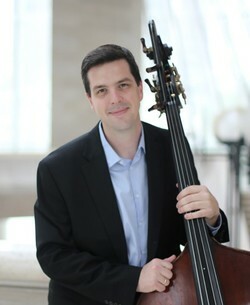 Concerto No 2 in A minor by Giovanni Bottesini is the only work on the program originally written for the double bass. Bottesini was also a skilled opera conductor and friend of Giuseppe Verdi, for whom Bottesini conducted the premiere of his opera "Aida" to mark the opening of the Suez Canal, Perry explained. "He frequently borrowed themes from various operas and composed fantasias he often performed between acts or in recitals to the delight of audiences everywhere," Perry said. The work features the singing quality of the bass while also demonstrating the virtuosity of the performer by traversing the entire length of the instrument, a skill Bottesini was known for in his performances.